Over the weekend of 27-28 February, members of the Sikh Research Institute’s (SikhRI) education team travelled to Connecticut, USA. In those two days, SikhRI educators facilitated two full-day teacher training sessions, a workshop for children and promoted the newly-launched Sikh Educator’s Network (SEN). Teacher trainings are part of the services offered to promote effective implementation of SikhRI’s Sojhi curriculum. Sojhi was developed and refined over several years, and currently provides comprehensive lesson plans appropriate for students, Kindergarten through Middle school. Sojhi was developed for Sikh educators as high-quality resources that provide standard educational benchmarks for Gurmat and Panjabi school students. The Level II training on the 27th was held in Norwalk and about 20 educators were in attendance. The administrators of Guru Gobind Singh Ji Academy (GGSA) had contacted SikhRI to schedule the training and were able to express their specific needs for the full-day session. This allowed Jasmine Kaur, SikhRI’s Director of Education, to customize the sessions and bring trainers that were most qualified to address the areas of GGSA’s need. “At SikhRI we want to meet the needs of educators and develop a plan that will be most beneficial to them. In doing so we identify our best resources out there who have had first-hand experience in engaging children at all levels,” said Jasmine Kaur. The second workshop covered stages of human psycho-social development and the importance of designing activities appropriate and stimulating to students’ needs for collaborative and independent learning. “At the end of the workshop, I made the connection that Guru Nanak Sahib also wrote about human development in Bani. After He highlights developmental stages of humans, He reminds us without connecting with your Guru, it is difficult to live life in harmony,” Jasmine Kaur said. The following session was led by Harliv Kaur, owner and publisher of Kikli and a long time education consultant with SikhRI. Her workshop, titled “Resources Here, Resources There, Resources Everywhere,” walked instructors through the importance of creating a safe and secure classroom for students and crafting an environment rich with resources that stimulate student learning. Many of her ideas were incorporated into the classroom set where the instructors had begun the day, including a Gurmukhi word wall and class calendar with dates and days in Gurmukhi. The fourth workshop was led by Harpreet Kaur Neelam, Instructional Coordinator of the Curriculum in Science and Technology for the Peel School Board in Ontario, Canada. She illuminated the development of the teenage brain with a special focus on using the cooperative learning method to engage adolescents. The following day, Jasmine Kaur led a children’s workshop on a Sabad of Bhagat Kabir Ji. Thirty-two elementary- aged children attended the highly interactive session. 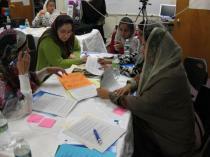 Later on 28 February, SikhRI facilitated a Level I Teacher Training in Southington for 11 educators. The Level I training typically centers on content and instruction and focuses on preparing instructors in the core foundations of successful teaching methods when using the Sojhi curriculum. These include going over effective techniques for using questions to promote curiosity and learning, and the implementation of graphic organization in the classroom. “This is a very good program given in a detailed way to understand students [and the] relation between child and teacher. It will benefit adults, children and management. We learned...how to handle different levels of kids,” said Manjit Kaur of Hartford, CT. Content areas which were covered in this session included teaching about the Pledge of Allegiance and the Khalsa Anthem and a discussion of the cohesion of the message and methodology of the Gurus. Inderpreet Singh, who serves on SikhRI’s Board of Directors and frequently presents on behalf of the SikhRI, was also a facilitator at this training. The Level I training also focused heavily on Peer Mentoring Resources in encouraging educators to develop strategies and relationships with their colleagues and other networks which allow for mutual success and advancement. Facilitating avenues for peer support and resource sharing factored largely into SikhRI’s recent launch of their Sikh Educators Network (SEN). The Network is a forum where educators from all over the world can come together and share ideas and resources. SEN was developed in response to educators’ requests for such a platform and represents an effort on SikhRI’s part to fulfill our mission to constantly improve the effectiveness and ease of use of Sojhi curriculum. Through SEN, SikhRI has provided lesson plans and supplementary materials to those who register with the Network. Most of these files are ready for immediate download and use in the classroom. There are also resource materials to help teachers develop and create ideas. At this point, registration with SEN is free and educators everywhere are strongly encouraged to join. A login ID is necessary to access some areas of content, as well as to comment on blogs and to start new discussion threads. Please visit our web site at www.sikheducatorsnetwork.org today to see all that is available. If you are interested in scheduling your own teacher training or have questions or comments related to Sikh Educators Network please contact Jasmine Kaur.